As architectural practitioner, educator, and founding principal of di Domenico + Partners, John di Domenico has fostered a studio synergy based on principal-led group involvement that has resulted in a successful practice and award-winning design accomplishments. His current projects explore innovation and sustainability in the civic realm, including conceptual design for a high speed rail system that redefines travel along the Boston-Washington corridor, transformation of two buildings for Cornell’s College of Agriculture and Life Sciences, several projects under the New Visions for Public Schools program in association with the NYC School Construction Authority, and the development of sustainable landscape design for the United Nations New York campus. 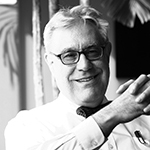 Additional highlights of his career include leading the design of Brooklyn’s new Atlantic Terminal Complex, planning and architectural prototypes for the Washington D.C. Metrorail extension along the Dulles Corridor, and receiving the Sidney L. Strauss award presented by the New York Society of Architects in recognition of outstanding achievement for the benefit of the architectural profession. A member of the architecture faculty at the New York Institute of Technology, Professor di Domenico teaches Design Studio and City Planning. Sharing his equal passions for theory and making has consequently led many NYIT alumni toward collaborative projects in his professional design studio. He has also served as the Dean and Chair of the Architecture program. Outside of academic and professional pursuits, di Domenico is an avid painter across mixed media. His work is often a visual commentary on current architecture projects in the studio. A native New Yorker, di Domenico attended Brooklyn Technical High School and is a graduate of The City College of New York and Harvard University’s Graduate School of Design. He was a Fulbright Scholar in Italy. He serves on the Boards of the New York Transit Museum and Coney Island USA. His additional accolades include grants and awards from the National Endowment for the Arts, Municipal Art Society of New York, NY Landmarks Conservancy, and the American Institute of Architects NY Chapter.